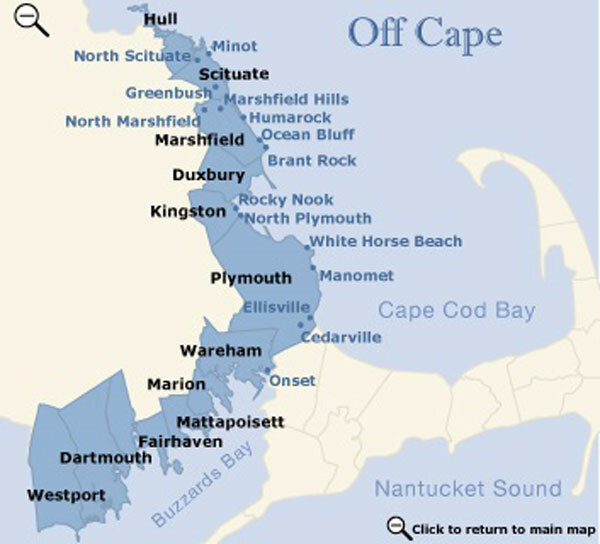 Plymouth is a town picturesquely located on Plymouth Bay, about 34 miles southeast of Boston. It is considered "America's Hometown" as it was the site of the first permanent European settlement in New England. The pilgrims founded Plymouth on Dec. 21, 1620, establishing a settlement that became the seat of Plymouth Colony in 1633 and a part of Massachusetts Bay Colony in 1691. Today this historic town is a fishing and tourist center with ship-related industries and cranberry-packing houses. Plymouth Rock is a major tourist attraction, located on the harbor shore under a granite canopy. Also fun to visit are recreations of Plimoth Plantation and the Mayflower. Myles Standish State Forest offers more than 16,000 acres for hiking, biking, picnicking, swimming, fishing and canoeing, including 15 miles of bike trails, 20 miles of equestrian trails, 35 miles of recreational vehicle trails and three miles of hiking trails which take visitors deep into the pine forest. Several ponds are stocked with bass, perch, and pickerel. Plymouth offers a nice choice of nearby beaches. Plymouth Long Beach has a beachhouse, rest rooms, lifeguard, snack shop, and is frequented by the ever popular ice cream trucks. Squirrel Run Country Club is Plymouth's only public 18 hole executive golf course, but a good one. Plymouth's Colonial Lantern Tour has been called Plymouth's Top Tour in the Los Angeles Times. It allows visitors to explore the town's historic district, the original plantation site, the waterfront, Brewster Gardens and Town Brook. You'll find antique shops and trendy boutiques along with gift and souvenier shops. Enjoy fresh local seafood in one of the many waterfront and waterview restaurants or spend the evening in one of the watering holes, all along the harbor's edge. With all of this, the Town of Plymouth continues to maintain its small town charm and offers visitors from across the globe a chance to experience part of the New England's early history and seasonal charm.